Located in Sitio Catadman, Poblacion, Dalaguete, Cebu. 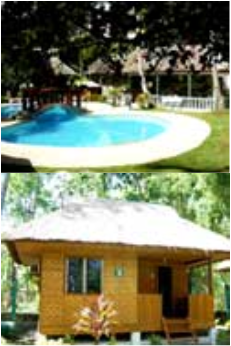 Uy Cottages are located in Sitio Catadman, Poblacion, Dalaguete. Cebu. Rockwalled Pension House is located in Barangay Coro, Dalaguete, Cebu. Coco Beach House is Located in Sitio Catadman, Poblacion, Dalaguete, Cebu. Ocean Bay Resort is located in Sitio Guiwanon, Poblacion, Dalaguete, Cebu. Located at Sitio Dumlog, Manangal, Dalaguete, Cebu is the ultimate holiday treat of a lifetime... Cebu Countryside Villa and Resort. A four storey villa with a great view of the sea. A touch of antique furnitures and fixtures mixed with modern baroque objects. One can choose from a variety of rooms which come in different sizes and styles. Located at the patio overlooking the blue sea is a bar with a wide choice of imported wine where one can relax and unwind after a hard day's work. Located at Barangay Balud just a few kilometers south of Barangay Poblacion, Dalaguete, Cebu is JUST-INN COTTAGES. Made of clusters of native-style cottages, it offers a cozy ambience for travelers and families who long for homegrown comfort and gastronomic delight. Located at the near center beside the restaurant/bar is the much visited swimming pool which provides an alternative venue for a safer and water fun in the day and a romantic rendezvous for couples at night longing for an overnight dip.